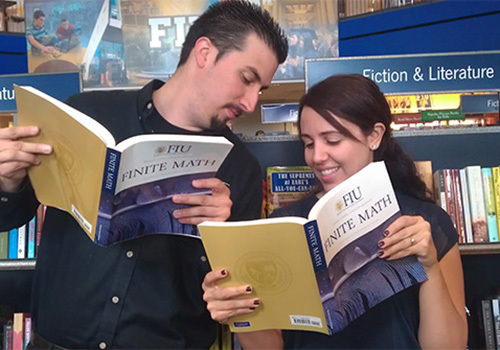 Jonatan Alvernaz and Cristina del Busto hold copies of the math book that brought them together at the FIU Bookstore in Miami, Florida. For most students, the campus store is where you pick up your textbooks, study with friends or meet for a cup of coffee. You don’t usually stop by to grab the love of your life, along with the latest bestseller. 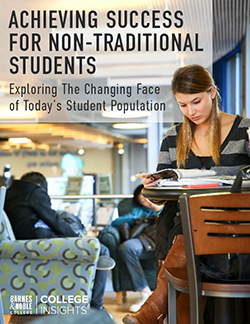 But recently, Cristina del Busto and Jonatan Alvernaz, two Florida International University (FIU) students, did just that. The couple met in 2005 when del Busto was picking up a textbook for her Finite Math course at the FIU Bookstore – Modesto Maidique Campus. While shopping, she found that she couldn’t shake the persistent attention of a fellow customer who wanted to sell her his textbook. Annoyed, she just wanted to browse in peace. Fortunately, a knight in shining armor was just around the corner. Alvernaz had just finished symphony band practice and was walking into the store with a mutual friend, who introduced him to del Busto. She shared that she had acquired an unwanted “friend,” and while del Busto and Alvernaz bantered back and forth, the bothersome shopper eventually got the hint and left. They both shared a laugh and parted ways – only to meet again a week later in their Finite Math course, using the very textbook del Busto bought on that fateful day. True to its beginning, the relationship continued to grow at the FIU Bookstore on the Modesto-Maidique campus, with “mini dates” in the store’s café to study, and chat sessions over coffee and breakfast. They discovered a mutual love for music and playing instruments, and eventually, del Busto joined Alvernaz in the symphony band at FIU. 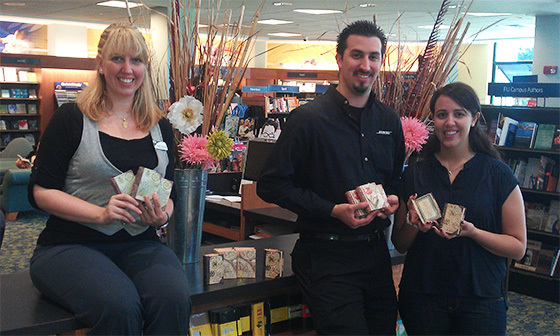 Former Trade Supervisor Crystal Jarrouge helped Jonatan Alvernaz and Cristina del Busto find and order the perfect wedding favors. Del Busto came back with her fiancée and approached Crystal Jarrouge, then trade supervisor at the FIU campus store, to ask if they had smaller versions of the book boxes they could use as favors for their upcoming wedding. “I could tell finding the right gift card holder was very important to them,” explained Jarrouge, who is now manager of the Furman University Bookstore in Greenville, South Carolina. “I was really charmed by them as a couple – and when they told me their story, I knew I had to help them with their request.” She dug right in, and after searching the store, she found gift-card holders that looked like mini-book boxes. After showing four different designs to her wedding party, the excited bride-to-be called back the next day and placed an order for the chosen gift box. The next week, del Busto and Alvernaz picked up 100 perfect book boxes to celebrate the place where they had met and fell in love. The happy bride and groom-to-be have since received their undergraduate degrees, and del Busto is currently enrolled in the doctoral program in clinical psychology at FIU. While Jarrouge cannot guarantee that every customer will find their perfect love match in the campus store, she prides herselve on providing the highest level of customer service, with a personal touch. Stories like del Busto and Alvernaz’s may be rare, but the dedication and enthusiasm shown by managers like Jarrouge is standard at the FIU Bookstore, a campus store that has been managed by Barnes & Noble College since 1985.